Nearest weather station, with distance and direction from RNA: The nearest weather station is at St. Bernard in Cullman Co. Maximum and minimum temperatures: January mean temperature is 43.6°F, July mean temperature is 78.3°F, the mean last killing frost in spring is on April 8, and the first frost in fall is on October 24. The growing season is 199 days. Elevation: The elevation is 800 ft. at the north end to 580–600 ft. at the south. Geology and Soils: The RNA lies entirely within a canyon entrenched into the Cumberland Plateau. It is bounded on all sides except the south by the canyon escarpment. The sandstone cliff has sheer drops of up to 100 ft. Huge blocks of the sandstone caprock break away to form extremely rough talus like slopes. The slope surfaces are classified as bouldery colluvium with Jefferson soil material. Aquatic Features: The Bee Branch RNA drains from north to south. Bee Branch Creek falls into the gorge at 720 ft (215 m) and flows into the Sipsey River at 520 ft (177 m). Plant Communities: Old growth hemlock (Tsuga canadensis) - beech (Fagus grandifolia) community, southernmost range limit for hemlock. In 1977 two co–dominant tree species were Fagus grandifolia and Tsuga canadensis. In the 1989 sample, Tsuga canadensis had a higher importance percentage than Fagus grandifolia (Gunasekaran et al. 1992). The flora is a relic of a more northern flora which may be second to none in the eastern United States, probably the last sizeable remnant of virgin cove hardwood forest. At Risk Species: None are known. The diana fritillary butterfly has been seen in the RNA. Common Shrub Species: The dominant shrubs were briars (Smilax spp., grapes (Vitis spp.) and mountain laurel (Kalmia latifolia). Common Herbaceous Species: The understory is relatively open with much of the low ground cover consisting of sedges and a diversity of liverworts. A sedge (Carex picta), partridge berry (Mitchella repens), violets (Viola spp.) and Japanese honeysuckle (Lonicera japonica) are very common. Common Bird Species: Dozens of chimney swifts (Chaetura pelagica) can be observed along the cliffs. Additional reports and publications can also be found by clicking on the “RNA Publications and Products” link in the site menu or by clicking here. Hardin, E.D. 1978. Quantitative analyses of the vegetation and abiotic factors in a disjunct hemlock community in Alabama. M.S. Thesis, The University of Alabama at Huntsville. Hardin, E.D. and K.P. Lewis. 1980. Vegetation analysis of Bee Branch Gorge, a Hemlock-Beech community on the Warrior River basin of Alabama. Castanea 45:248–25. Mohlenbrock, R. H. 1990. Bee Branch, Alabama. Natural History 99(3): 80-82. Devall, M. S. and P. F. Ramp 1992. 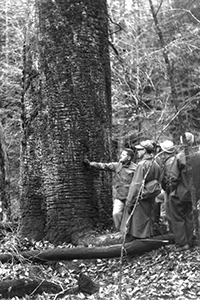 U. S. Forest Service Research Natural Areas and protection of old growth in the South. Natural areas journal 12(2): 75-85. Gunasekaran, M.; Weber, D. J.; Sanderson, S. and Devall, M.S. 1992. Reanalysis of the Vegetation of Bee Branch Gorge Research Natural Area, a Hemlock-Beech Community on the Warrior River Basin of Alabama. Castanea 57(1): 34-45.